As of Tuesday, 245,950 rides have occurred since the Great Rides Bike Share program launched on March 15, 2015. 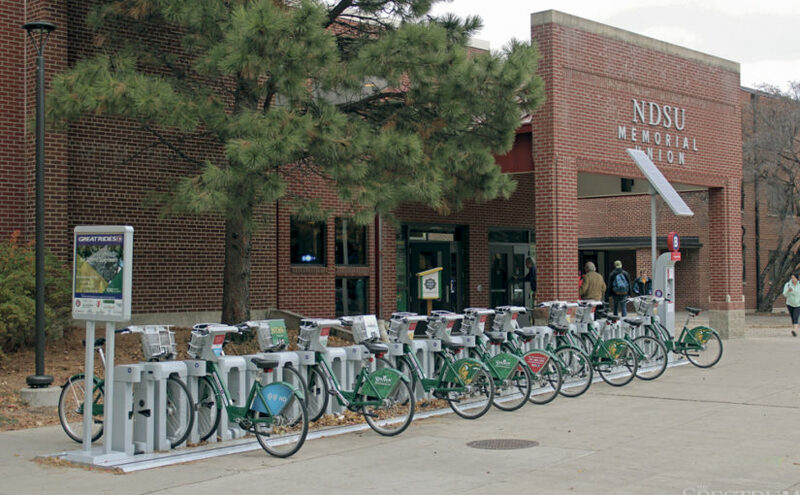 Bike Share is a way students can travel to places around campus, and in certain places around the Fargo-Moorhead area. There are currently 100 bikes in use to dock at 11 stations. The bikes enable transportation and cut down on fuel consumption. They feature a three-speed gear system, a basket to hold your belongings and an adjustable seat for comfort purposes. Bikes can be checked out by pressing the silver button located on the station, and scanning your student ID or swiping a Visa or MasterCard and pulling the bike away from the dock. If paying with Visa or MasterCard, each hour will cost the rider, $4.00. The individual can keep the bike for up to an hour. When the bike is ready to be returned, riders push the bike into an open slot at the docking station. Great Rides move bikes around to different docking stations throughout the day to make sure that bikes are available for riders at most stations. An app, B-Cycle Now, is also offered to allow riders to view the number of slots in a specific dock and how many bikes are currently at the dock and in surrounding areas to ensure that the rider can find a place to return their bike too. This will ensure the rider can locate a bike and have a place to re-dock it as well. Bikes can only be checked out between the hours of 6:00 a.m. and midnight. Helmets are not required for the rider, nor are they provided. The docks and bikes leave campus for winter hibernation Sunday. Riders can also report issues to Great Rides, so they are aware of any maintenance necessary. Looking forward, Great Rides said it hopes to increase not only student growth but public growth as well; by increasing the number of stations they have and the number of bikes available. Watson Curry said as of press time, Great Rides is trying to make a smooth transition into winter hibernation. There have been no missing bikes yet this season, however Watson Curry reports that last season one bike did go missing and is yet to be found.